Christian authority of Loyola College apologises ultimately after BJP, Hindutva outfits protest vehemently against derogatory art exhibition against Hindus, Bharat Mata and PM Modi. B Upendran | HENB | Chennai | Jan 21, 2018:: The war between the BJP and famed Loyola College (which is actually as Jesuit Roman Catholic Institution) in the city heated up yesterday and today regarding an ‘anti-Hindu’, ‘anti-National’ and ‘anti-BJP’ picture exhibition put up on its premises as part of its Veedi Viruthu Vizha (Street Show Award), leading to the institution issuing an apology. It was reported that the event had been organised by the college’s student support services, which assists Dalit students and those from other vulnerable groups. Sources says, the anti-Hindu urban Naxal, Dalits and Christian groups organised the ‘offensive’ show. The BJP and other Right wing Hindu groups in Chennai came together to protest by means of complaint against the Loyola College over the alleged disrespect shown by it to ‘Hindu religion, Prime Minister Modi, Bharat Mata, Rafael Deal and Swachh Bharat’ at the festival organised in the name of promoting folk arts. 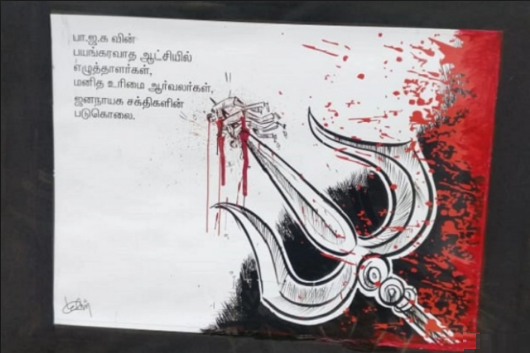 BJP national secretary, H Raja, had actually called for “all Hindu nationalists and patriots” to assemble at the DGP office to file a petition against the college management for displaying “derogatory” and “demeaning” paintings at its two-day event – Veedi Viruthu Vizha – on reviving traditional art forms held at the college on 19 and 20 January. 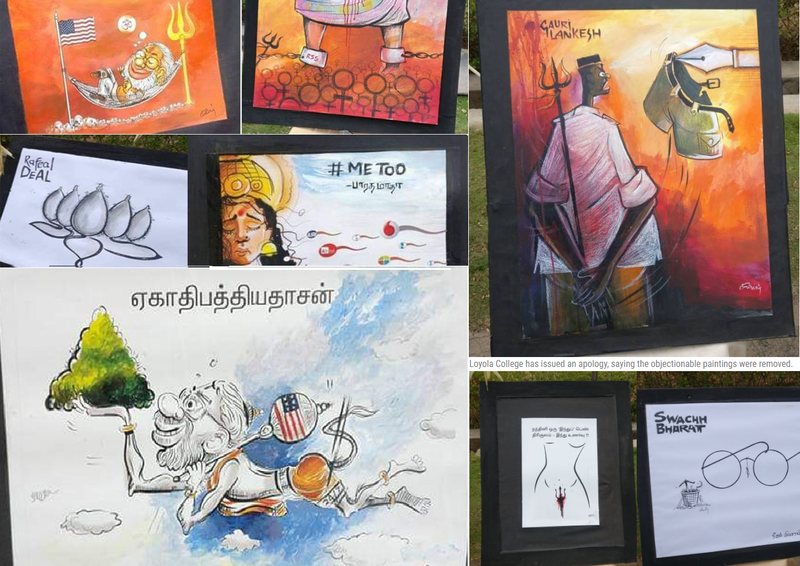 Over the weekend, social media users shared images from the art exhibition, where derogatory drawings of Bharat Mata, in the context of the #MeToo Movement, and Prime Minister Modi, were displayed. Not only that PM Modi was mocked in a shape of Lord Hanuman and the weapon of Lord Shiva- Trishul (Trident) was drawn as female genital. However, when News Today+ contacted Loyola College for its views, the faculty and management expressed their backing for students who displayed the art and said “art must be viewed as art”. The lack of response from the college management did not go down well the BJP, though. 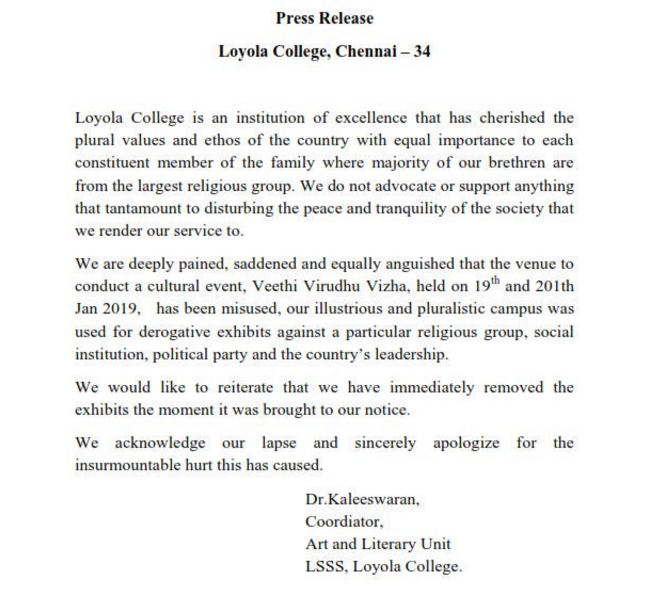 Sensing the huge repercussion against the ‘controversial’ exhibition, an apology was issued to the press ultimately by Loyola College today saying. “we are pained and saddened that the venue to conduct a cultural event has been misused”. But, many of the viewers in public criticized the Christian authority of Loyola College that the management was quiet indulgent to allow those offensive picture show before it was drawn to protest. We’re a non-profit body creating awareness against Christian & Urban Naxal conspiracies against Nationalism and Hindutva. Make a donation and help our cause. This entry was posted on January 21, 2019 by hinduexistence in Anti National, Anti-Hindu, Attack on Hindu Sentiments, Attack upon Hindu Sentiment, Attack upon Hindus by Secular, Attack upon Indian Sentiment, Communist Menace, Conspiracy against Hindus, Conspiracy against India, Hindu Protest, Hindu Retaliation, Maoist-Naxalite Menace, Secular Menace and tagged Christian authority of Loyola College, Defamation of Bharata Mata, Defamation of Narendra Modi, Defamation of Swachh Bharat, Hindu Outrage, Loyola College Apologizes, Loyola College- Chennai, Veedi Viruthu Vizha.